My daughter Gianna loves cold food. I keep the fridge regularly stocked with cucumbers and hummus for her after school snacking. She also frequently asks if I can make her some charcuterie or a salad for her school lunch. Considering I was eating Ruffles, Kit Kat, and a Mountain Dew when I was in the seventh grade, I am happy to comply. She inspires. 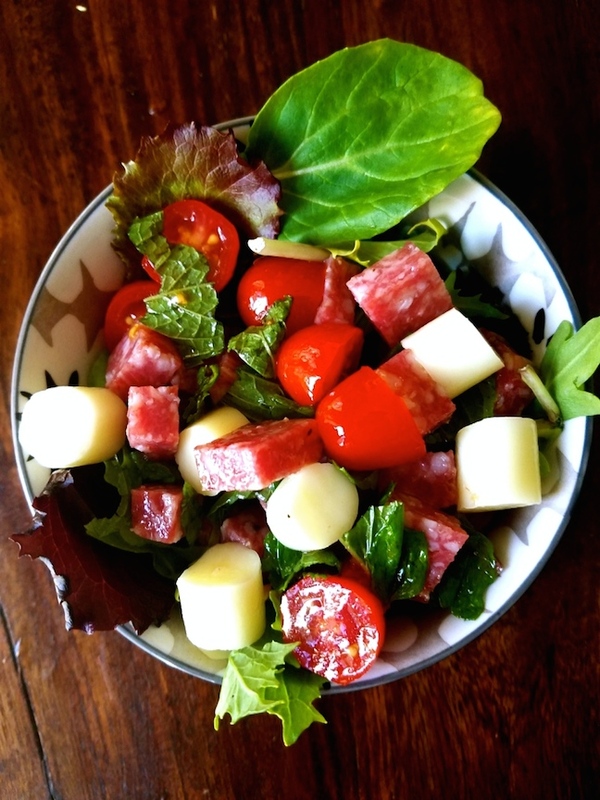 This salad was made with some of my daughter's favorite things. And now that summer is here, who else wants cold food? Mix the olive oil and vinegar in a small container. Shake until well mixed. Combine all other ingredients. Add dressing. Add salt and pepper. It's a great recipe for a snack at school! You can find more of such at testimonials on Bestessays and your daughter won't be disappointed for sure. Please tell me why always when I check out new recipes, they always look so good and fancy. But when I make them by myself it’s look like hobo’s meal. I’m trying I swear, but always it look soo bad I don’t even want to make it second time at all. What is the secret?